Bi Luo Chun is one of the Chinese Top Ten Famous Teas. 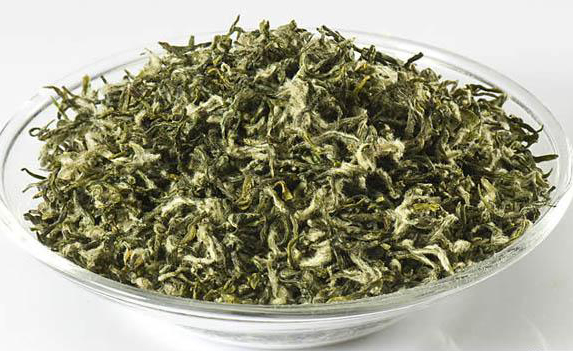 It is renowned for its slim tightly curly body, nimbus white pekoe, silver jade color, fragrant fruity flavor and sweet aftertaste. 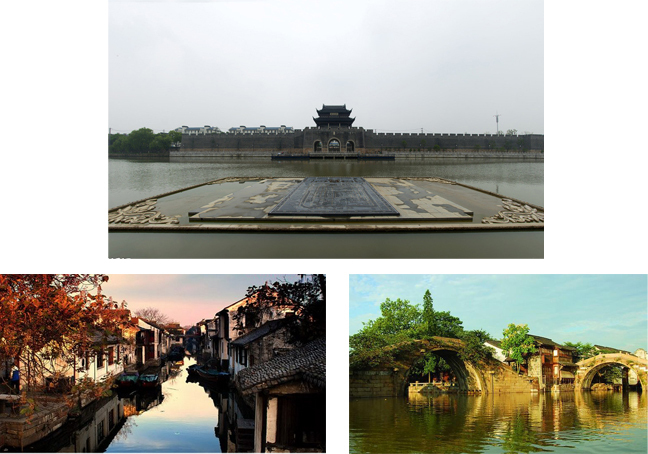 Bi Luo Chun is originated from the Dongting Island in Taihu Lake of Suzhou. 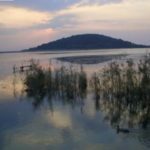 The Dongting Island of Taihu has thousand of years of tea planting history. This tea first appeared in history in the time of early Qing Dynasty from a local famous tea Xia Sha Ren Xiang (which means ‘astoundingly fragrant’). The emperor Kangxi visited the Dongting Island in 1699AD and the Xia Sha Ren Xiang was tributed to him by local official. Emperor Kangxi highly praised this tea after he tasted it, while he thought the tea name Xia Sha Ren Xiang was not elegant. The emperor himself re-named this tea as Bi Luo Chun (Jade Snail Spring). So the tea Bi Luo Chun became famous in all over the country. 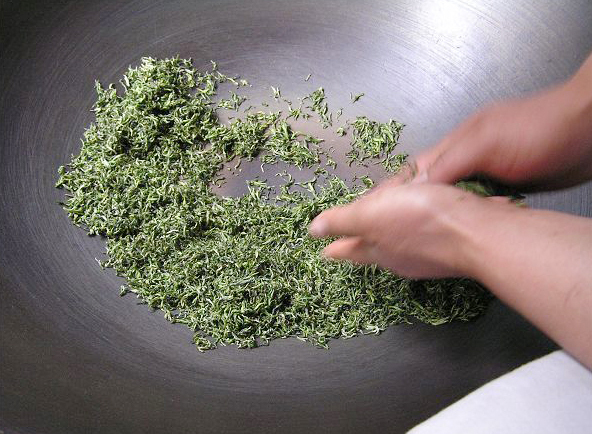 The Bi Luo Chun Green Tea grows on the East Mountain 西山 and West Mountain 东山 of Dongting Island. The soil on the island mountains is mainly composed by sandy yellow soil and rocks which offers good supply of organic nutrition and minerals for the tea growth. 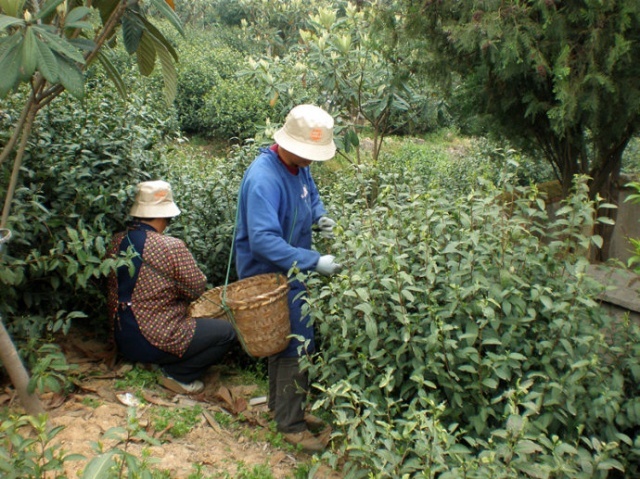 The farmers here have the tradition of planting tea intercroping with other fruit trees. eg. loquat, chinese waxberry (Myrica rubra), orange, peach and chestnut trees. This kind of intercroping is very good on the diversity of tea garden ecosystem. The tea and fruit trees grow well together and the pest can be naturally controlled. And also it is believed that the fruit trees contribute fragrance flavor to the Bi Luo Chun produced in the island. The plucking season of Bi Luo Chun is from Chunfen 春分(around March 21st) to Qingming 清明 (around April 5th). Bi Luo Chun has very strict requirement on the fresh material. It need one single bud or very tender one bud one leaf to make the tea. 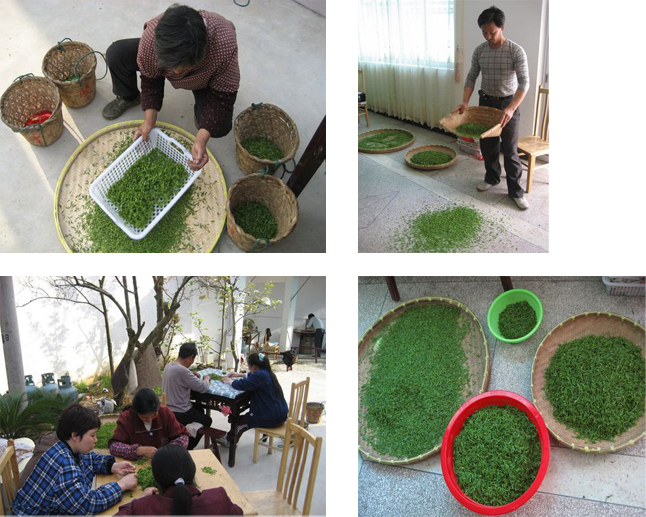 The top grade Bi Luo Chun will cost around fifty to sixty thousand single buds to make half a kilo quantity. The fresh material will undergo intensive hand sorting after plucking to ensure the material even and neat for the ongoing processings. Generally the plucking of tea is done in the morning 5:00-9:00am, the hand sorting will conduct at around 9:00am-15:00pm. At the same time, the tea will get withered. And the frying of tea will go on after 15:00pm till the night time. The traditional processing of Bi Luo Chun include four handlings, Frying, Rolling, Group rubbing and make tippy and Baking dry. All these handlings are conducted on the iron pan. And firewood is burning to heat up the iron pan. 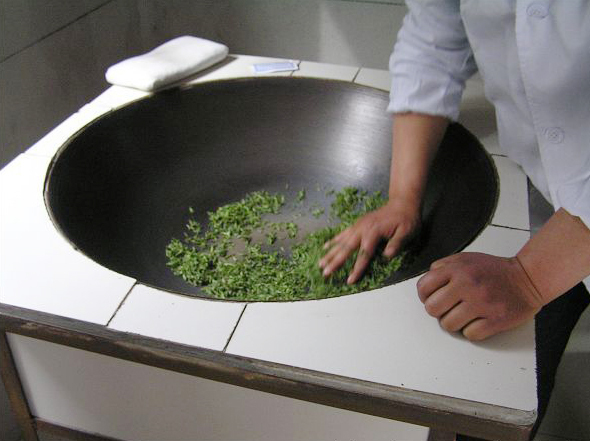 It uses the simplest equipment while it requires the most ingenious hand work to make the fantastic quality Bi Luo Chun. 1 Frying. When the temperature of the iron pan reaches 190-200℃, around 500g of fresh leaves will be put into the pan for frying. The hand will keep stirring the tea leaves to evenly fry them. The enzymes in the tea leaves will be quickly killed by the heat. The frying will be finished in 3-5mins. In-adequate frying will produce red leaves and stalk. And over-frying will produce burning flavor. They are not allowed. 2 Rolling. The after frying tea will be put on the lower temperature pan for rolling. The temperature of the pan is around 70-75℃. The hand will throw, fry and roll the tea. 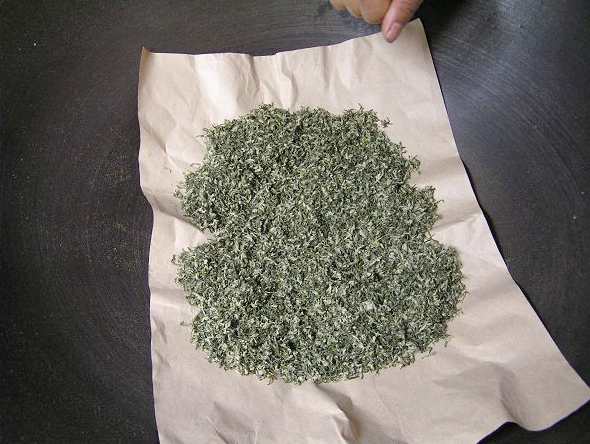 The tea body will be rolled and at the same time become dry as time goes by. When the water content is left at around 30-40% in the leaves, the processing will stop. The rolling will last around 12-15mins. 3 Group Rubbing and make tips. 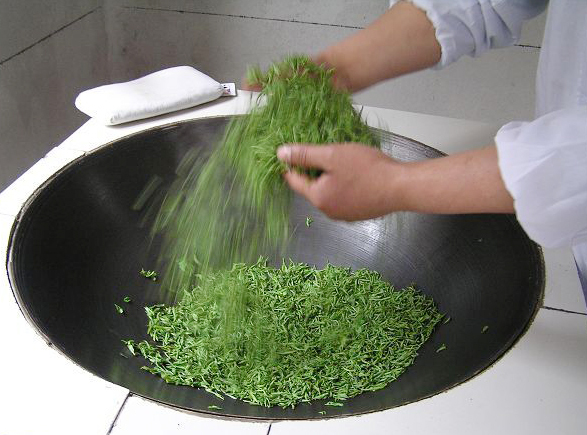 This processing is critical to make the tightly curly tea body and covered by white tips of Bi Lup Chun. The temperature of the pan of this processing is around 60-70℃. The tea will be rolled into small balls by hand and then be trembling dismissed. This handling will repeat for many times till the tea body is tightly curly rolled and white tips manifest themselves. This processing last around 13-15mins. 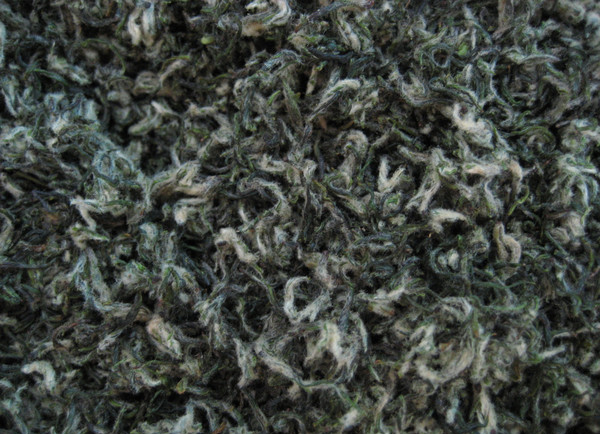 In the end of the processing, the water content in the leaves is left at around 20%. 4 Baking dry. The tea will be put in the pan with temperature around 50-60℃. And the hand will gently stir and roll the tea to make the tea body shape further fixed and dry. when the water content of the tea is left at around 10%, the tea will be put on a plant fiber paper and moved to the pan with temperature around 30-40℃ for further baking and dry. In the final, the water content is below 7%. The 500 grams of fresh material processed by the iron pan will obtain around 100 grams of dry tea product after the whole processing.